So, I am a little sad that I have not been able to update this blog as often as I would like – who would have thought things as silly as school and life might get in the way of food blogging?! Crazy. So, now that my fantasies of cooking a new inventive creation and updating daily are behind me (at least until I can get this grad school nonsense out of the way), I am going to admit that I haven’t cooked anything this week. My excuses? 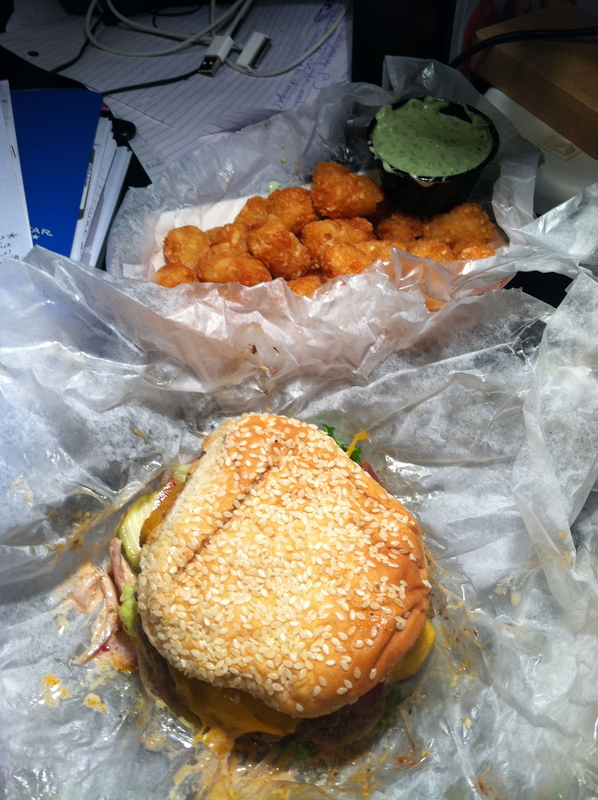 Midterm in my single subjects research class (stressful situations like that drive me straight to the bacon – bacon cheeseburgers + tots + jalapeno ranch dipping sauce to be exact – ooo if ANYONE can help me figure out a way to create that wonderful dipping sauce that they make here at Clocked in Athens, I would be forever grateful – but I digress). judge away but if anything can help de-stress after a long day (or multiple days) of studying and class-ing and midterm-ing – it is this amazingness from Clocked. 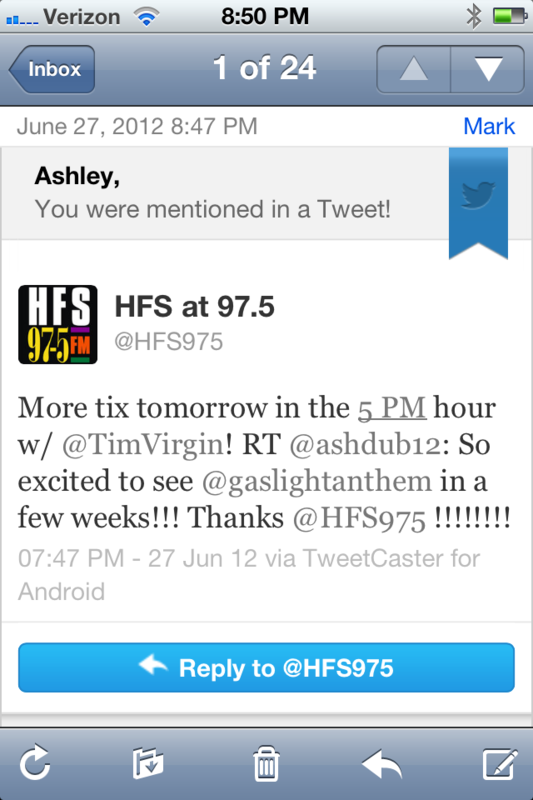 And yet another reason why I just don’t have the time – when I wasn’t studying/mildly freaking out about studying/in class, I was anxiously sitting by my computer listening to my favorite old radio station (WHFS) to win tickets to see The Gaslight Anthem. I am still having a hard time believing this but my hard work paid off – I ACTUALLY WON. I cannot even begin to express my excitement to be seeing one of my top 5 favorite bands (with one of my favorite concert companions!) in a teeny tiny venue in DC. So, all together, despite the lack of activity in my kitchen and whole midterm thing, this is turning out to be possibly the BEST. WEEK. EVER. So, anyways, aside from sharing my fun news with the internet – I do have a recipe to share (that is the whole point, right?). This recipe for Bacon Pasta is from pre-blog days (aka about 2 months ago), when I first started making a concerted effort towards using my leftovers. Now, I recommend throwing on The 59 Sound by The Gaslight Album (if you don’t have it or have never heard of them, do yourself a favor and go get it! Or at least hear it out on Spotify…along with the rest of their albums) and whipping up some yummy, bacon-y pasta while dancing around the kitchen. At least that’s what I like to do. 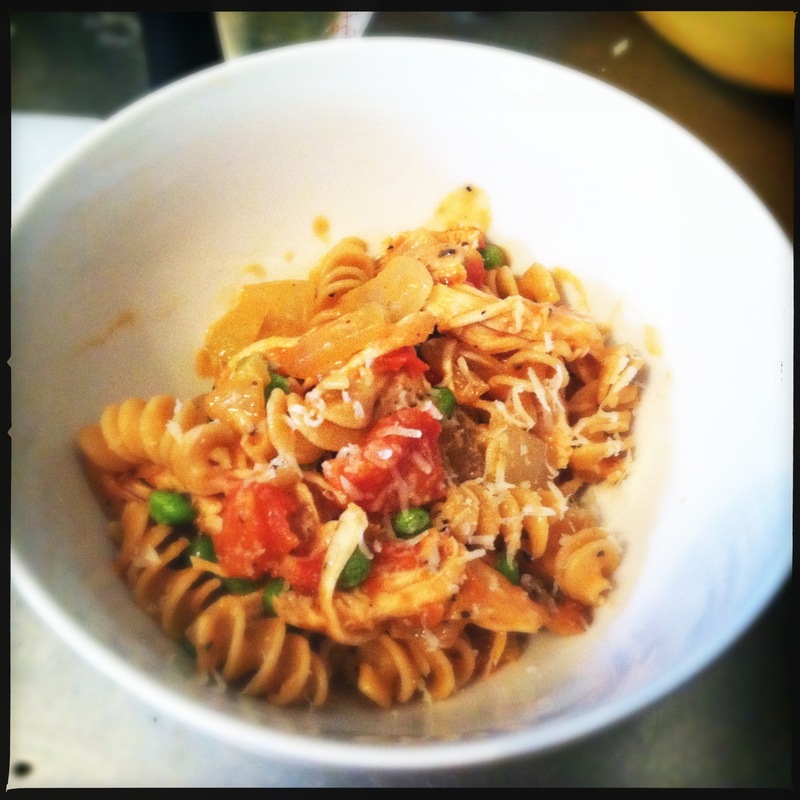 Bacon Pasta…w/ Chicken, Peas, & Thyme Too! 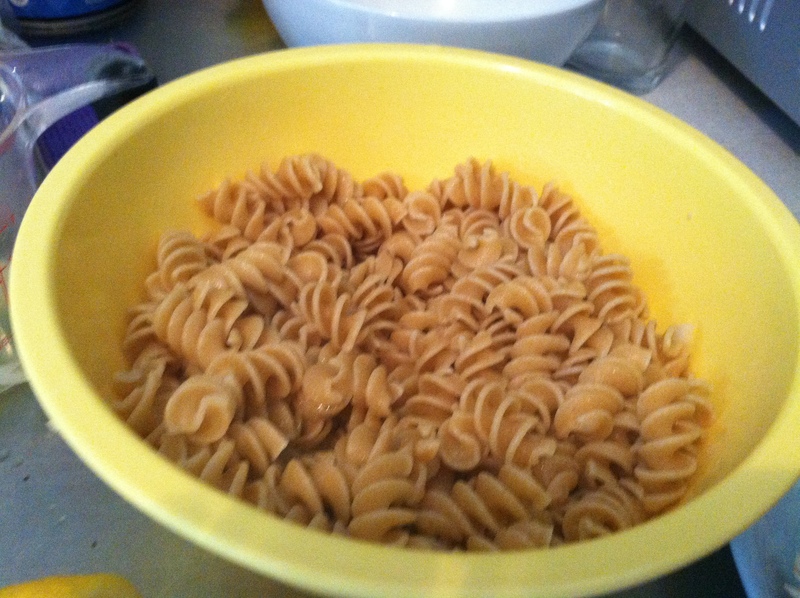 Bring water to a boil, add salt, and cook pasta al dente. Meanwhile, salt and pepper chicken breasts (both sides!). I bought chicken tenders – smaller/thinner/cheaper/faster cooking. 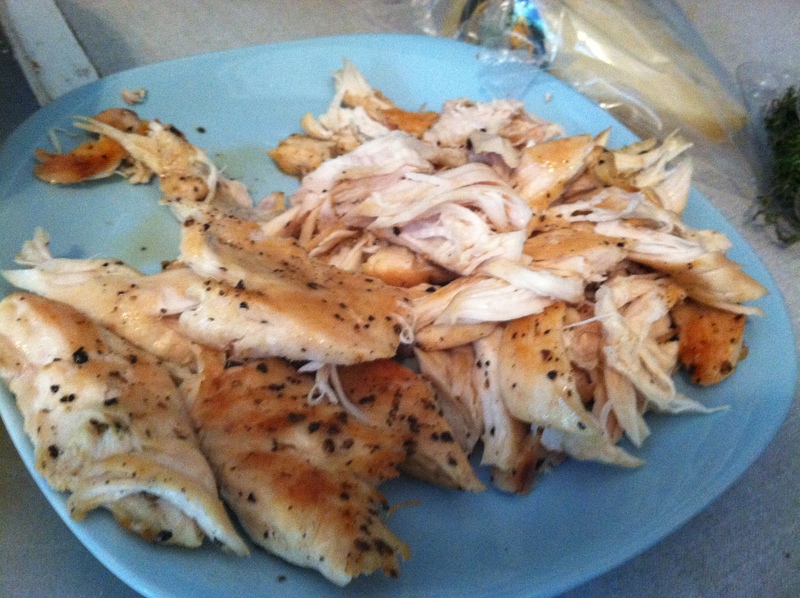 Drizzle olive oil in pan and fry chicken breasts, about 4 minutes on each side. Once cooled, shred. 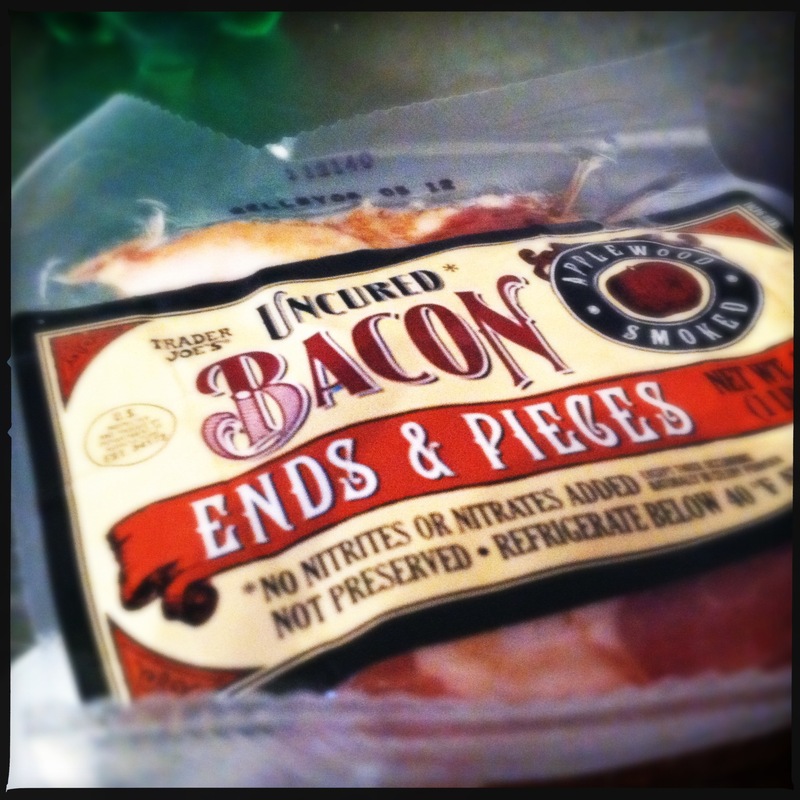 Cook bacon for a few minutes to render fat. Add garlic and cook for 1-2 more minutes, stirring constantly to prevent burning. 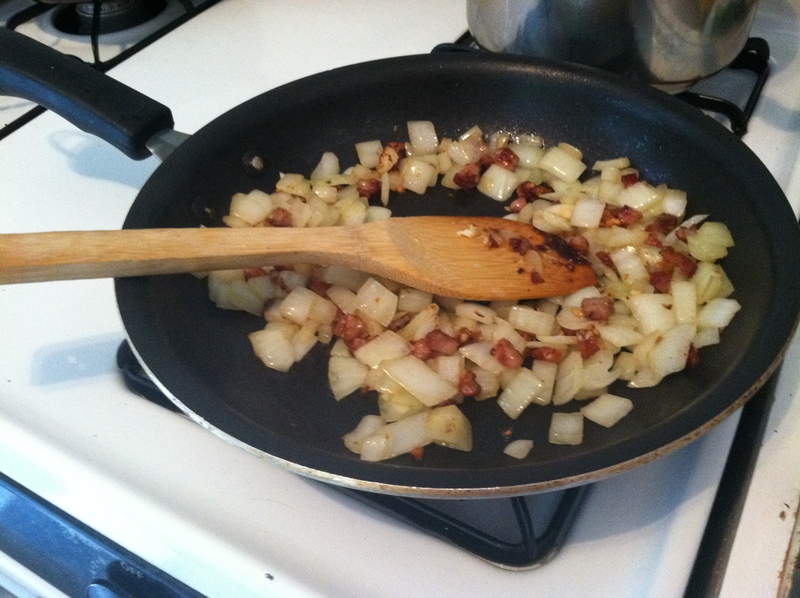 Add 1 tablespoon olive oil and onions, cook over medium low heat for about 10 minutes or until lightly caramelized. 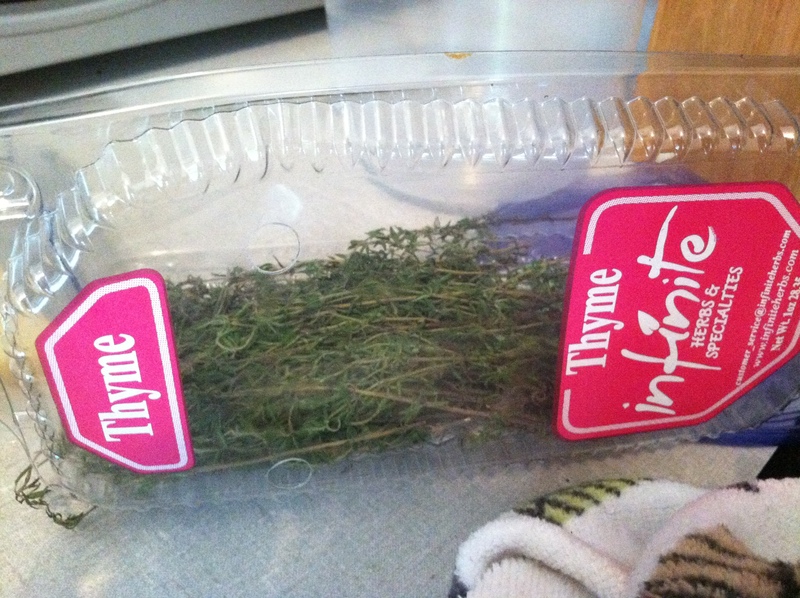 Add tomatoes, lemon juice and thyme, raise heat to medium and reduce. Once slightly reduced, add cream. 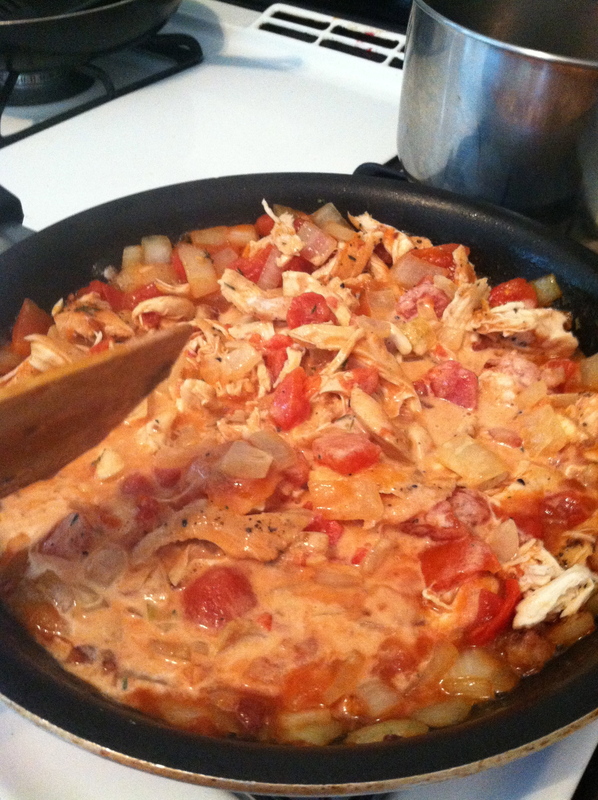 Cook for a few minutes, then add chicken and pasta. Right before turning off stove, add peas. Scoop into bowls, top with some freshly grated parm, and dig in. This weekend was AthFest here in Athens, GA, which means many things. 1. Tons of incredible live music from a variety of bands (most of whom I admittedly have never heard of) and 2. HOT HOT HOT weather. 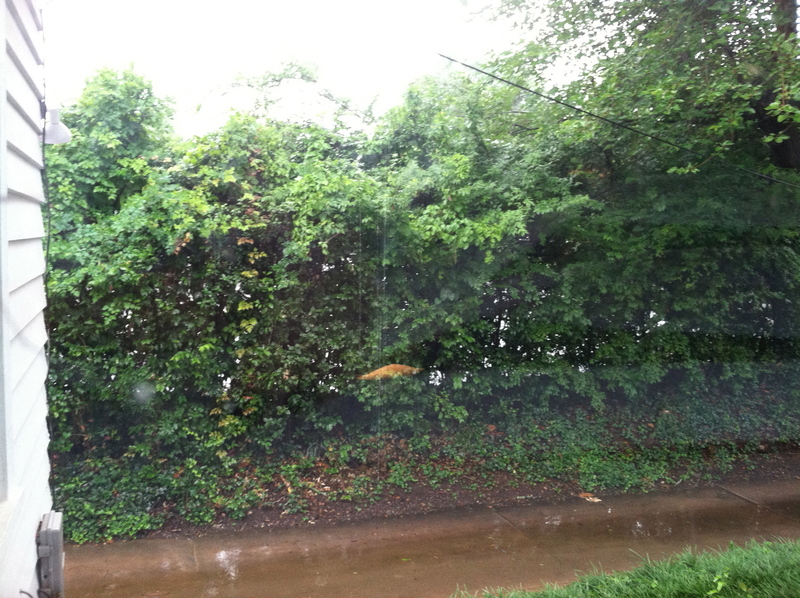 Yup, it is June in Georgia, so that means that the days of seeing temperatures below 90 degrees are long gone…probably not to be seen again until like, November. 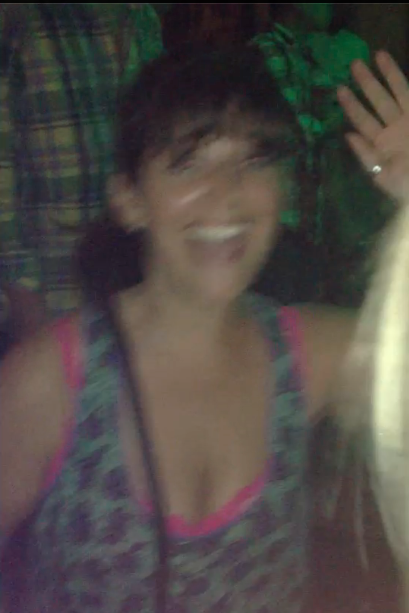 Maybe I am exaggerating, but whatever, it has been a sweaty weekend. Unfortunately, my enjoyment of AthFest was kinda limited this year – my professor for my awesome 5pm-9pm twice a week summer class decided on giving us a midterm this Tuesday (rude). After some intense studying during the day, I treated myself to some shows Friday and Saturday night (Reptar and The District Attorneys – 2 Athens bands that put on phenomenal shows…can’t wait until they come back!). Also, I thought I was being oh-so-smart waiting until the sun was going down to venture out into the heat, thinking maybe things might have cooled down a bit. WRONG. Still hot. So so so hot. And of course I saw a guy from King of Pops walking around tempting me with his cart full of refreshing homemade popsicles ($2.50 a pop isn’t really fitting in with my “budget” these days though). Now, if I only had popsicle molds I would use this recipe make my own King of Pops – that’s how good and refreshing this was. And, bonus, according to the folks over at Refinery29 – it not only hydrates, but de-puffs and turns couch potatoes into functional human beings (now you know how I managed to study for so long today!). I think this drink would make a great mixer for some vodka or tequila (party time after this midterm is over!). 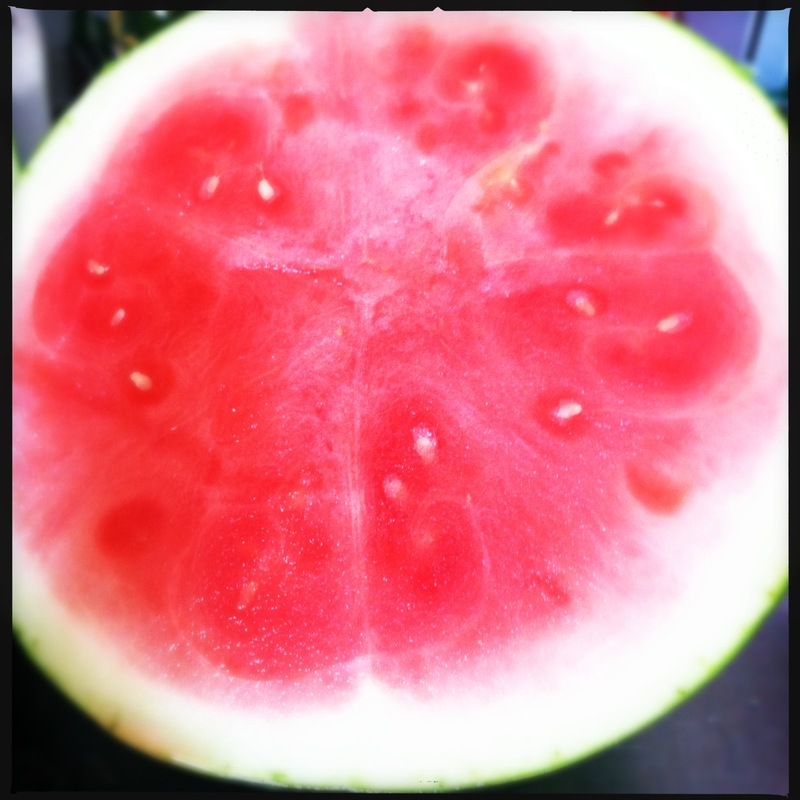 After having a not-so-hot watermelon margarita at a bar (it will remain unnamed) this weekend, I feel like I should go share this recipe with them. 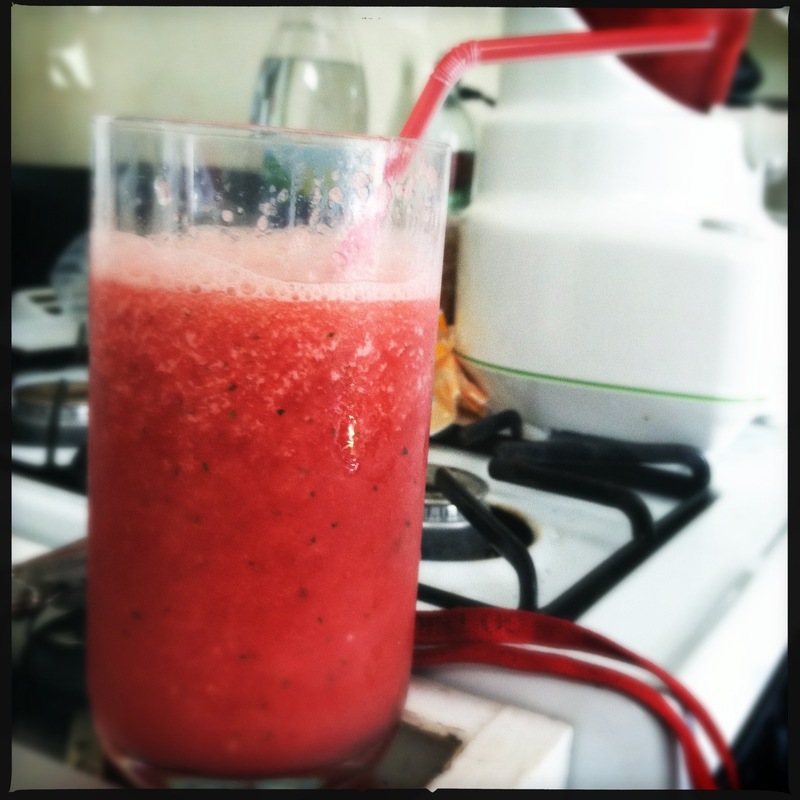 Throw all of the ingredients in a blender, mix, and enjoy!! This makes about 2 large glasses worth of smoothie. I added a little more sparkling water and a few more ice cubes (it is hot!) once it was in the glass for some extra refreshing-ness. 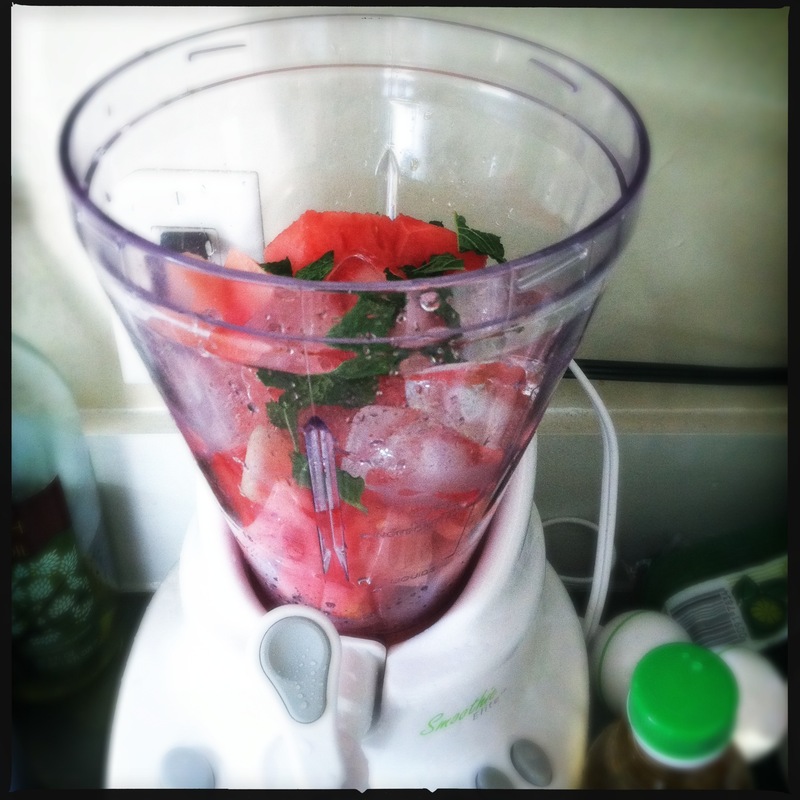 Smoothie Recipes- Watermelon Shake & Healthy Drink Idea. 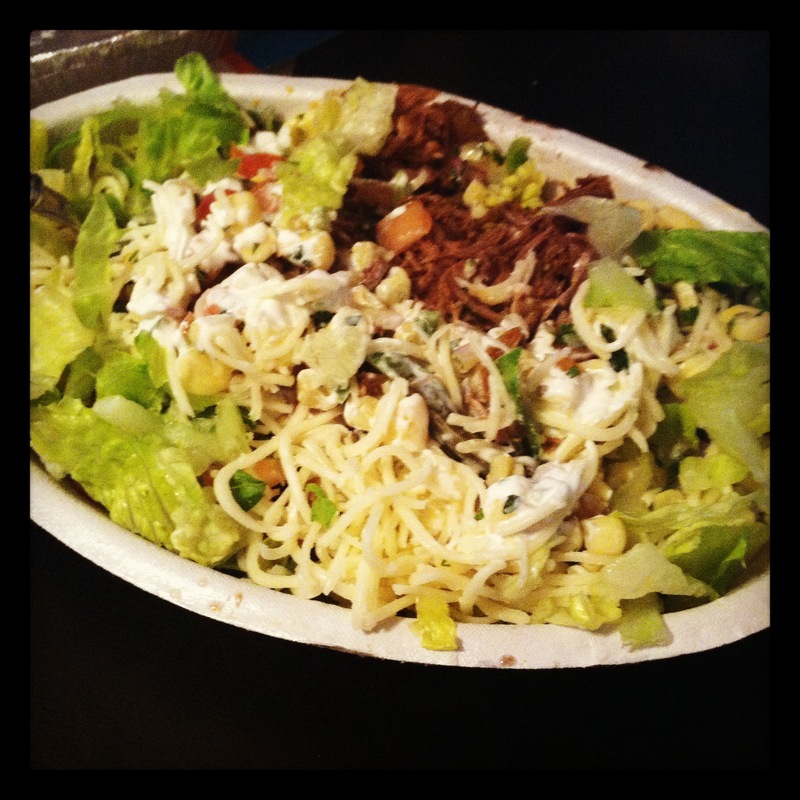 This would be PERFECT right now! 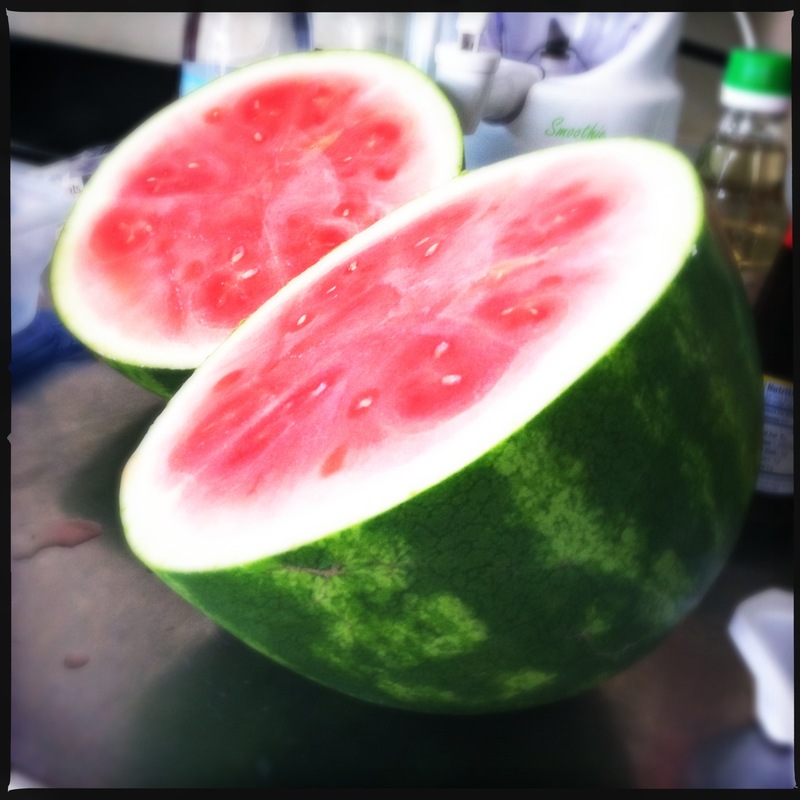 Watermelon will definitely be on my grocery list this weekend. 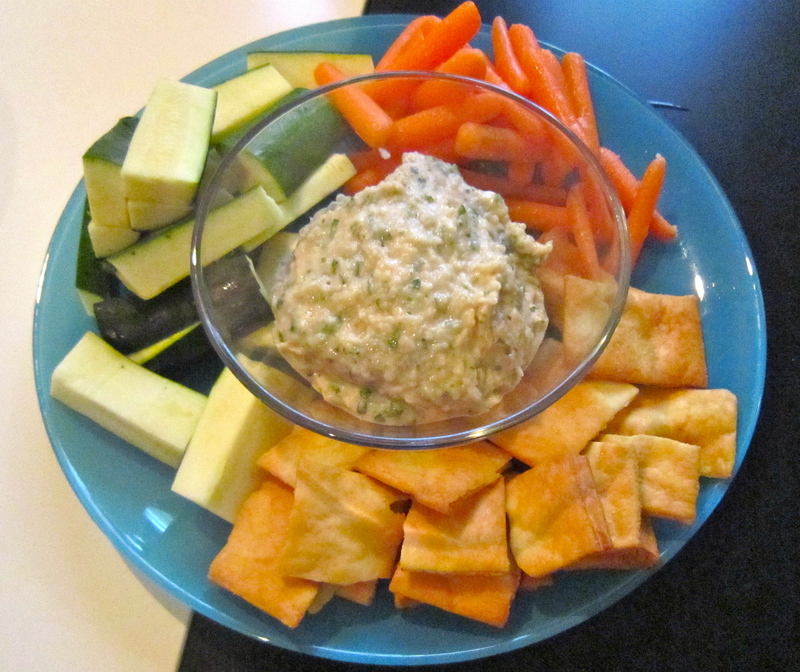 This white bean dip – slightly adapted from a Giada De Laurentis recipe – has been my go to dip for when I need to bring something to party that isn’t a baked good or when I have people over. It is always a big hit, but for some reason when it comes to just normal weeks with no food parties, I would just go to the grocery store and buy packaged hummus or some other dip (I am a bit of a dip fiend). Even though the grocery store stuff was nowhere near as satisfying as Giada’s white bean dip, I never thought to whip up a batch of the dip JUST FOR ME. What was I thinking?! Luckily, I recently came to the realization that I was being silly and started making it almost every other week. This dip is way easy to make, pretty inexpensive, and generally healthier than most of the pre-packaged products at the store. And it is TASTY! Giada might as well have called it garlic dip – the taste of garlic is super strong, but it works well with the smoothness of the white beans plus the herbs and lemon. 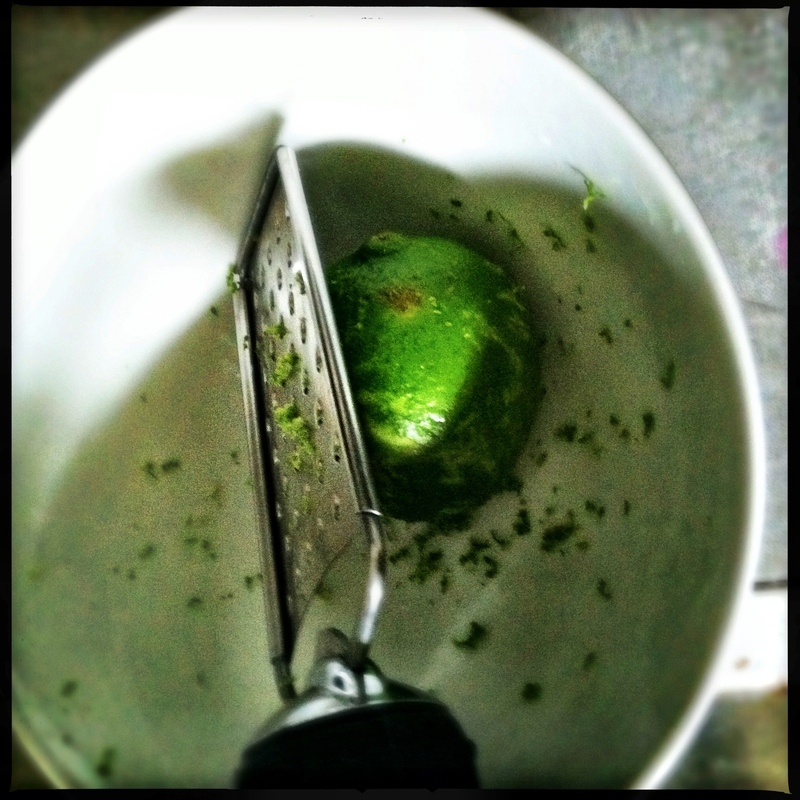 Now I like the extreme garlicky-ness, but if garlic breath isn’t your thing – I recommend roasting the garlic before adding it, or only adding 1 clove. I recently made this dip to eat for lunch paired with some carrots, broccoli, and sliced up zucchini (trying to be somewhat healthy to make up for the fact that I have been sitting in the clinic for 12+ hours a day). Also for the sake of being healthy, I cut down the amount of olive oil from 1/3 cup to about 3 tablespoons – and guess what?! It still tasted great and had that smooth, creamy texture. I added some basil leftover from the farmers market, a welcome addition to the dip in my opinion. My only wish was that I had some Marti’s at Midday pita chips to dip in it along with the veggies…but oh yeah, that whole healthy thing. For the original recipe – see White Bean Dip with Pita Chips Recipe : Giada De Laurentiis : Recipes : Food Network. 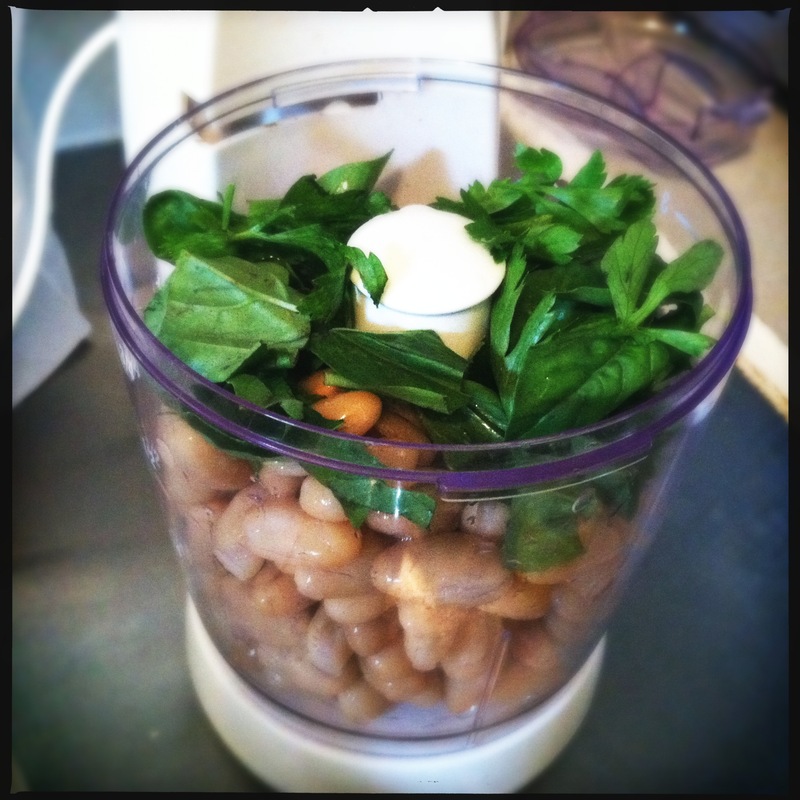 Add beans, garlic, lemon juice, olive oil, and parsley (or other herbs of your choice) into a food processor and pulse until mixture is smooth (or more coarsely chopped depending on preference). Season to taste with salt and pepper. Voila – easiest. dip. ever. *I don’t know if this is just me – but I always seem to have a hard time finding cannellini beans at the store. They are also known as white kidney beans. I did not realize this, but since making that realization, finding them has been much easier! **I used 1/2 parsley and 1/2 basil. I have also made the dip with dried oregano, which turned out good as well. 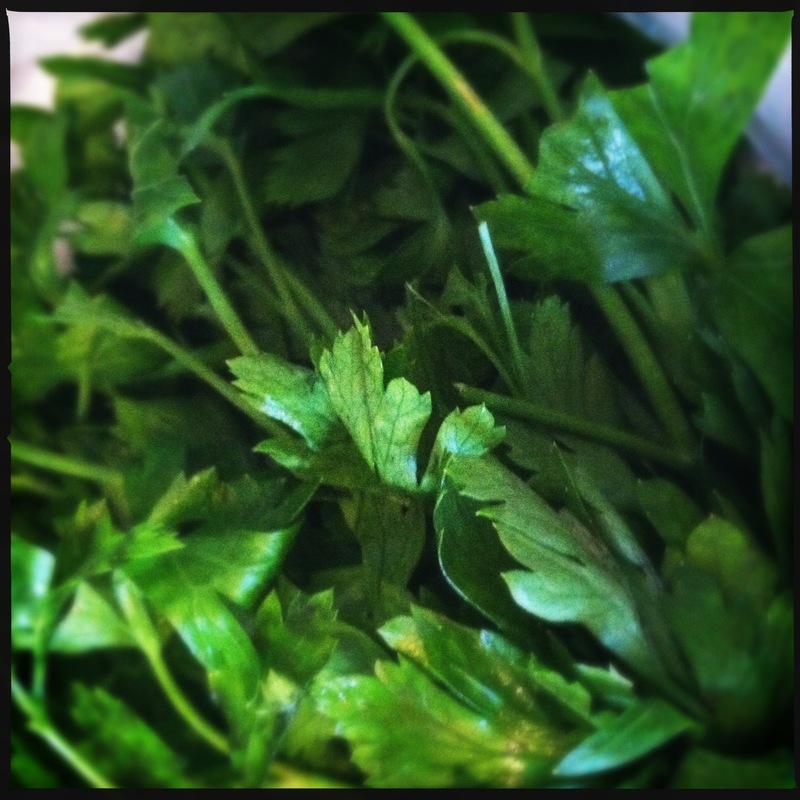 The fresh herbs are definitely better, but it seems to work with a variety of fresh and dried – so experiment! 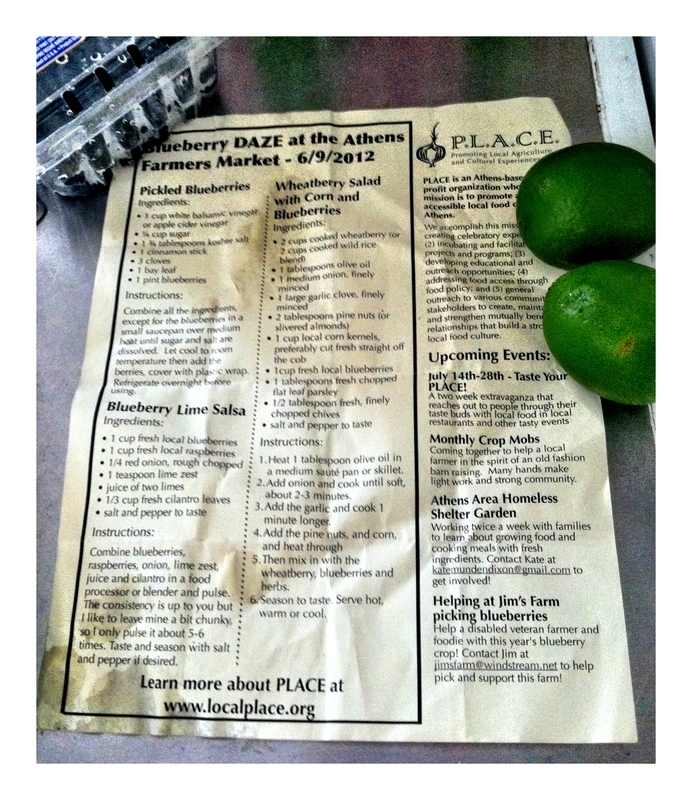 This week blueberries were the stars of the Athens Farmers Market. Looks like it is peak blueberry season here y’all! 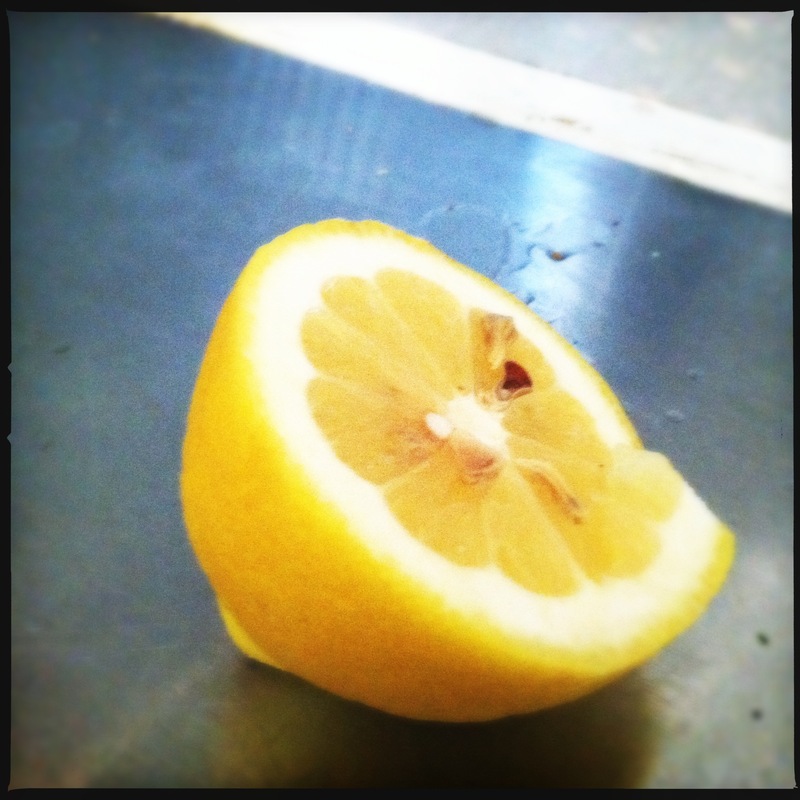 On Saturday, that meant cooking demonstrations at the market featuring blueberry-centric foods. While I was there, volunteers from P.L.A.C.E. 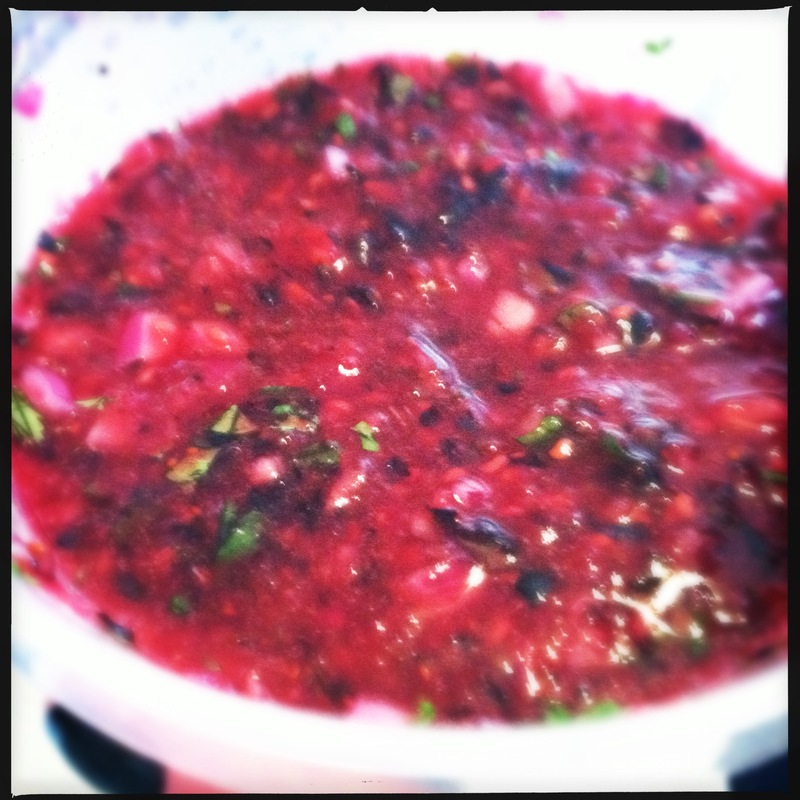 (a non-profit organization in Athens dedicated to promoting the local food culture – for more info see www.localplace.org) were whipping up some Blueberry Lime Salsa. 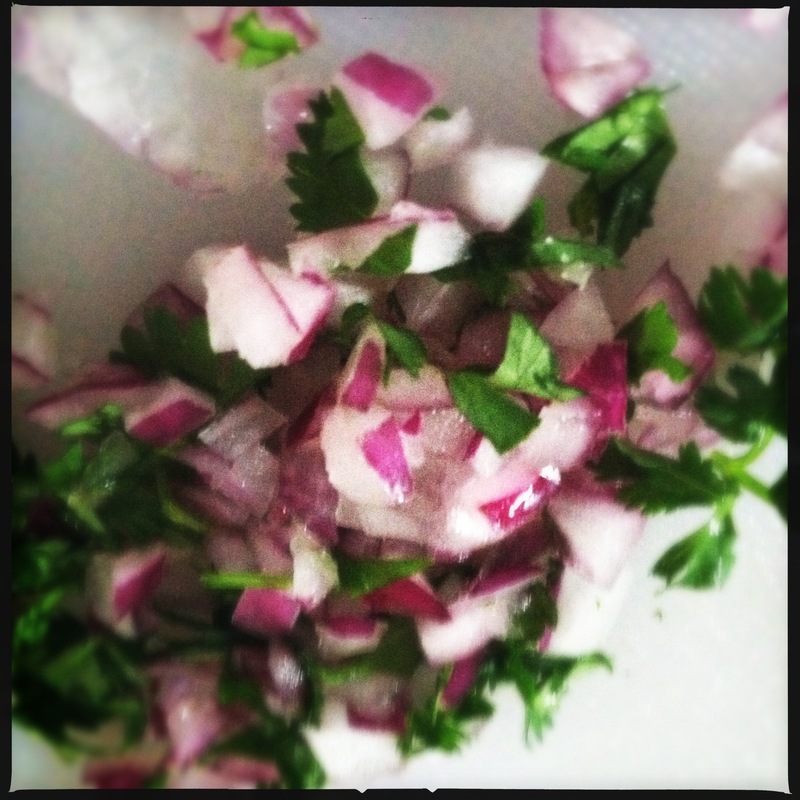 Initially, I was hesitant – I LOVE peach mango salsa (especially the kind my dad makes!) 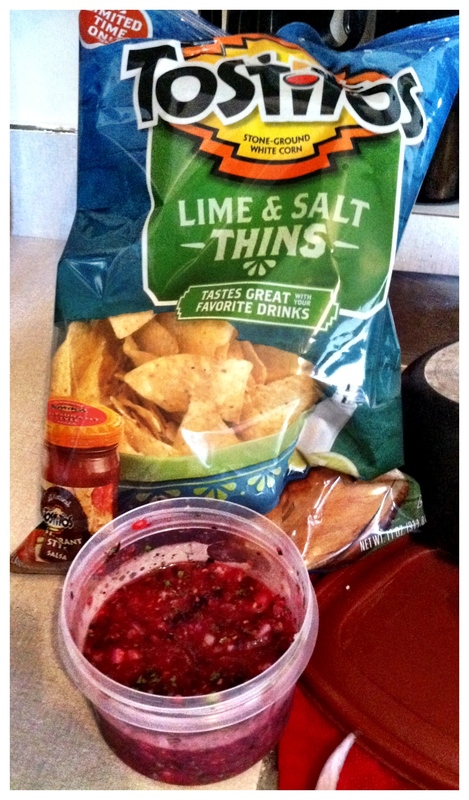 but I couldn’t picture blueberries in salsa. Oh how wrong I was! That stuff was addictive – I could probably eat it until I turned violet like Violet in Charlie and the Chocolate Factory. So of course, that went on the list of things I needed to make ASAP. Lucky for me, I had leftovers from my moderately successful attempt at Blueberry Raspberry Boy Bait. It was now time for them to redeem themselves in a new form, and they were definitely up for the challenge. 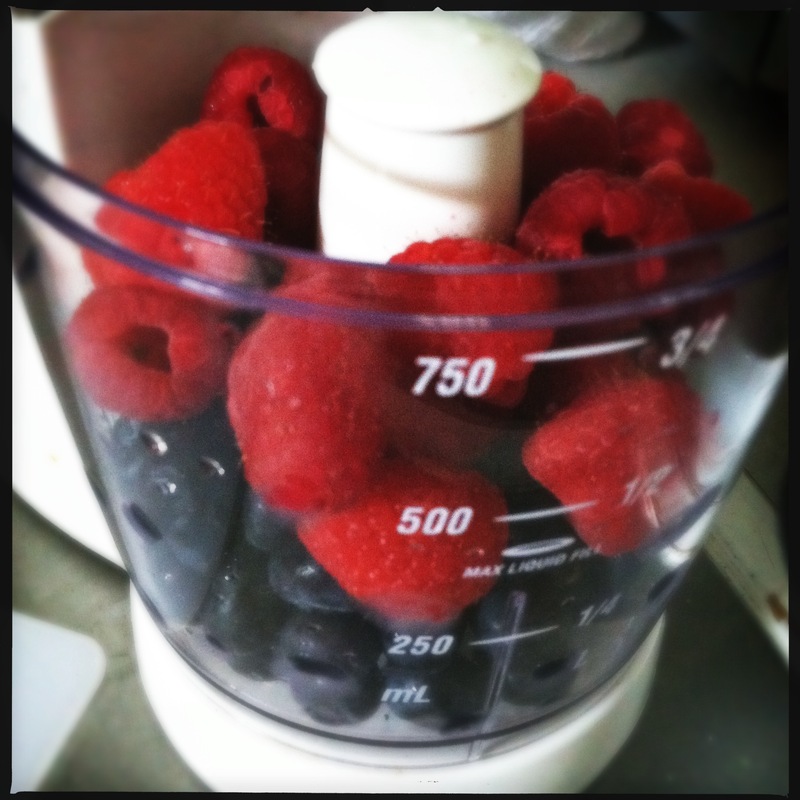 Combine blueberries, raspberries, onions, lime zest + juice, and cilantro in a food processor or blender. 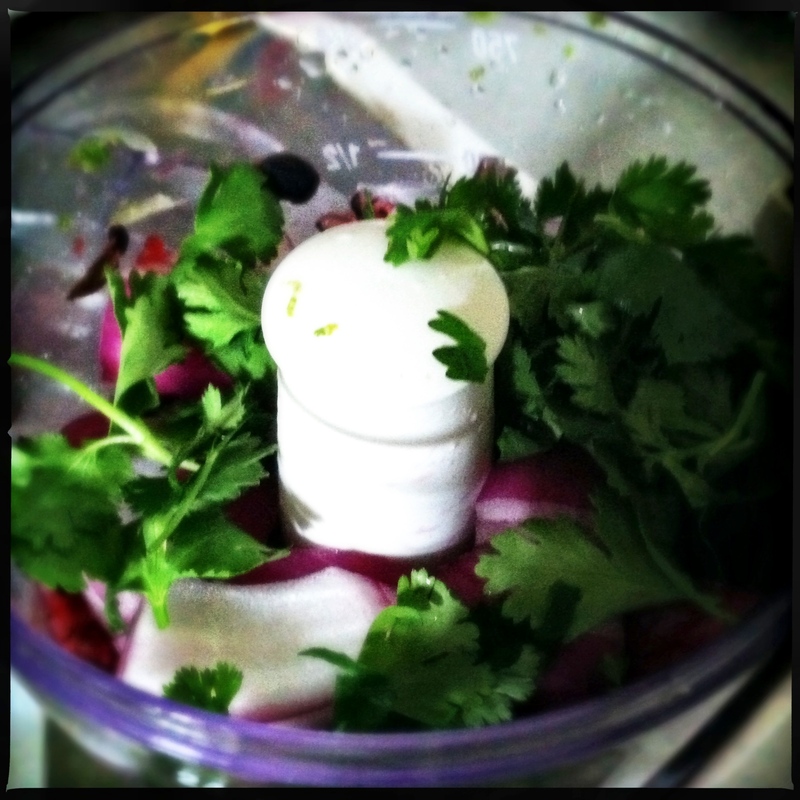 Pulse until you reach your desired consistency (I made mine really smooth because I had never made salsa in a food processor before and I was excited – but I also added some larger onion chunks post-processing). 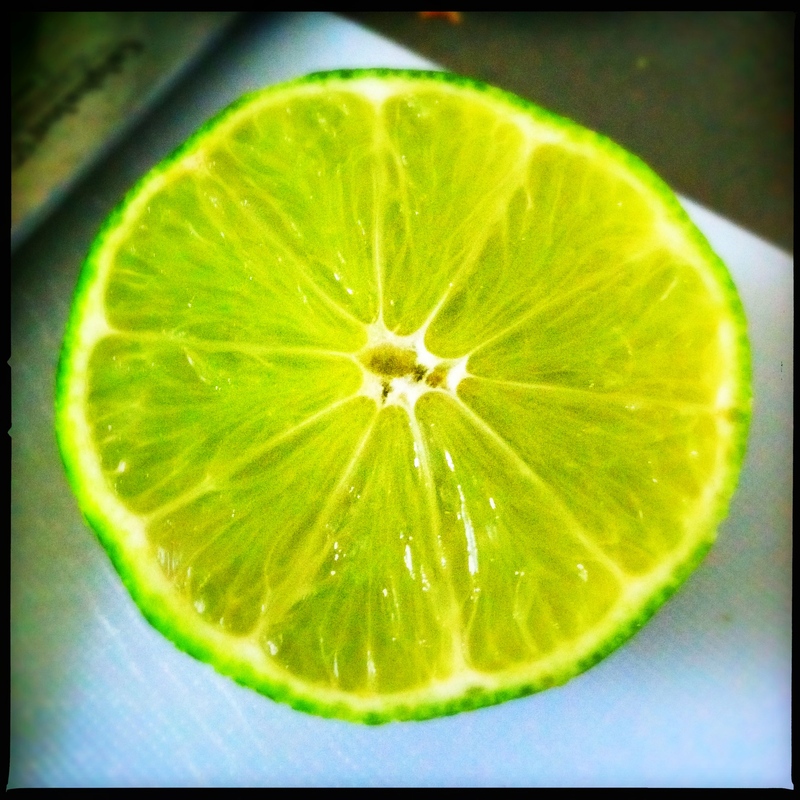 Taste and season with salt if desired (I probably added about 1/8 tsp of salt). The original recipe called for pepper as well, which I regretted adding but if pepper is your thing, don’t let me stop you from giving it a try! Finally, I thought that the salsa tasted even better the next day once the flavors had a chance to get all cozy with each other – so keep that in mind (and make extra if you are like me and cannot stop eating it!). 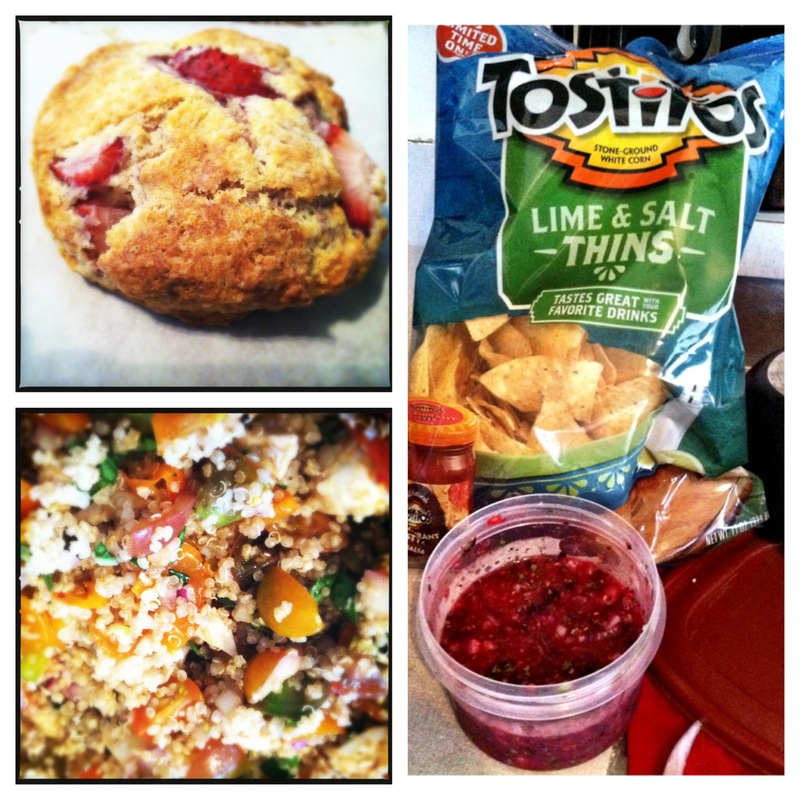 That’s right, the rain (plus my horribly busy crazy unhappy week with clinic and then friends leaving for internship 😦 ) drove me to make Strawberry Biscuits (recipe posted only a few days ago on Smitten Kitchen that I could not wait to make), Blueberry Raspberry Lime Salsa (I got a taste of that yesterday at the farmer’s market – amazing), and Quinoa Caprese Salad. 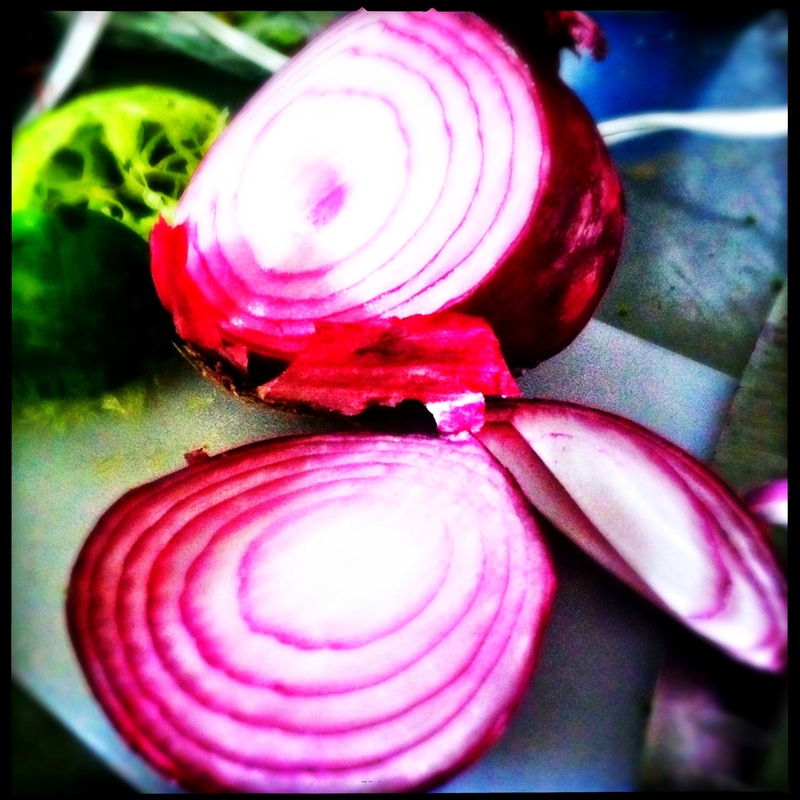 Nothing quite like unwinding in the kitchen – cooking and listening to music (today, The Menzingers – one of the bands opening for The Bouncing Souls in Atlanta this week. I hadn’t heard them before…pretty good!). Plus bonus – looks like I made enough food to last the week! Stay tuned for a post on the salsa – I have to get back to school stuff at some point since tomorrow is Monday 😦 For now, the Quinoa Caprese Salad! I’m going to be honest, I am not typically the biggest fan of raw tomatoes. 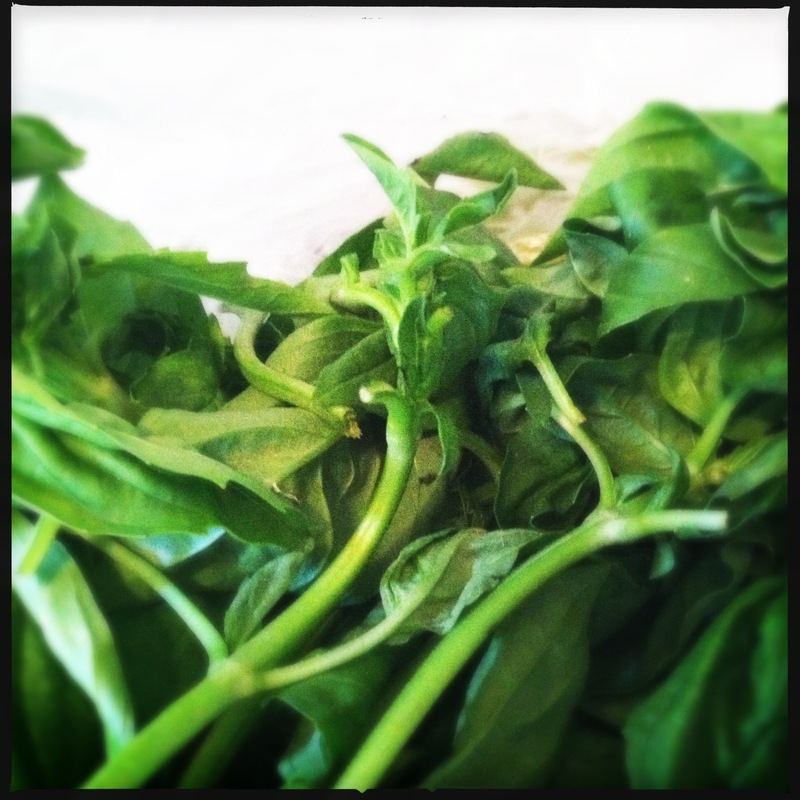 However, something miraculous happens when you combine them with some basil, garlic, balsamic, olive oil, and fresh mozzarella. 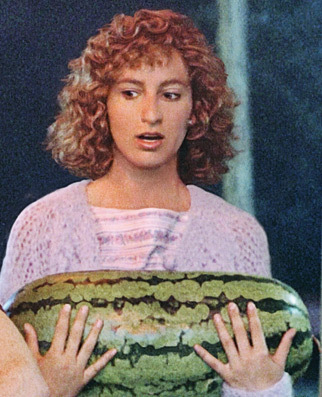 I think the people of Italy were on to something there with the invention of Caprese salads. 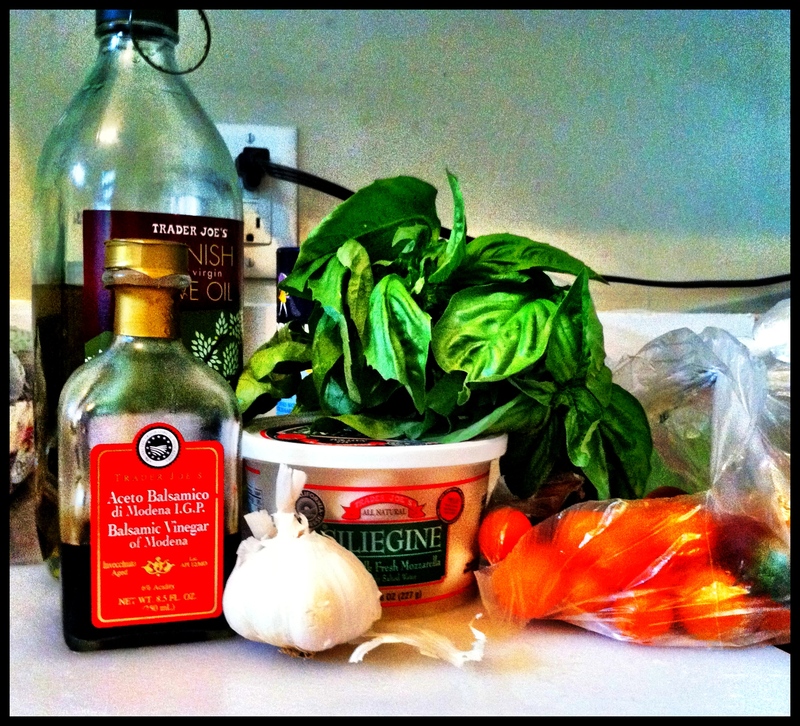 This weekend at the farmer’s market, I picked up some fresh tomatoes (they always taste better when it gets warmer out) and basil. 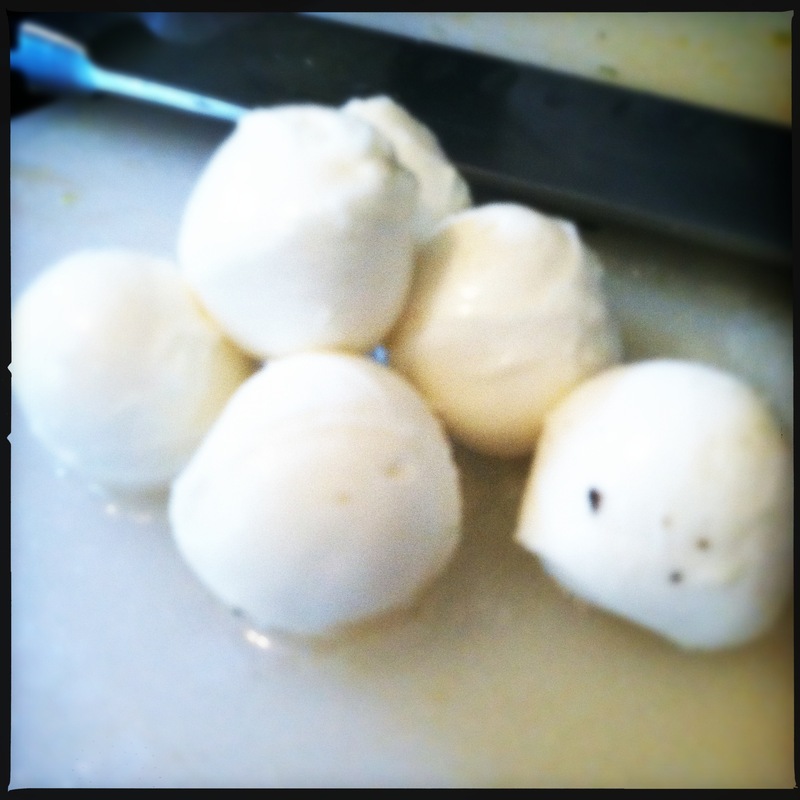 The minute I bought those 2 ingredients, I knew it was only a matter of time before I would be picking up some fresh mozzarella. Now these weren’t the cheapest ingredients, so I justified my spending by promising myself I’d eat this salad every day for lunch. My only concern was that the teeny amount of protein in the mozzarella would not be enough to get me through the day, which sparked a light bulb moment! Of course, I should throw some quinoa in there for protein to make the meal a bit more filling (I thought I was being oh so creative here…then I google searched “quinoa caprese salad” out of curiosity and my bubble was burst. Oh well, while it may not be groundbreaking it is at least healthy and tasty). I am not lying when I say I am super pumped to eat this for lunch this week. Prepare quinoa and let cool. I usually use a ratio of about 1 cup dry quinoa to 1.5 cups of liquid (for this recipe I used lightly salted water). 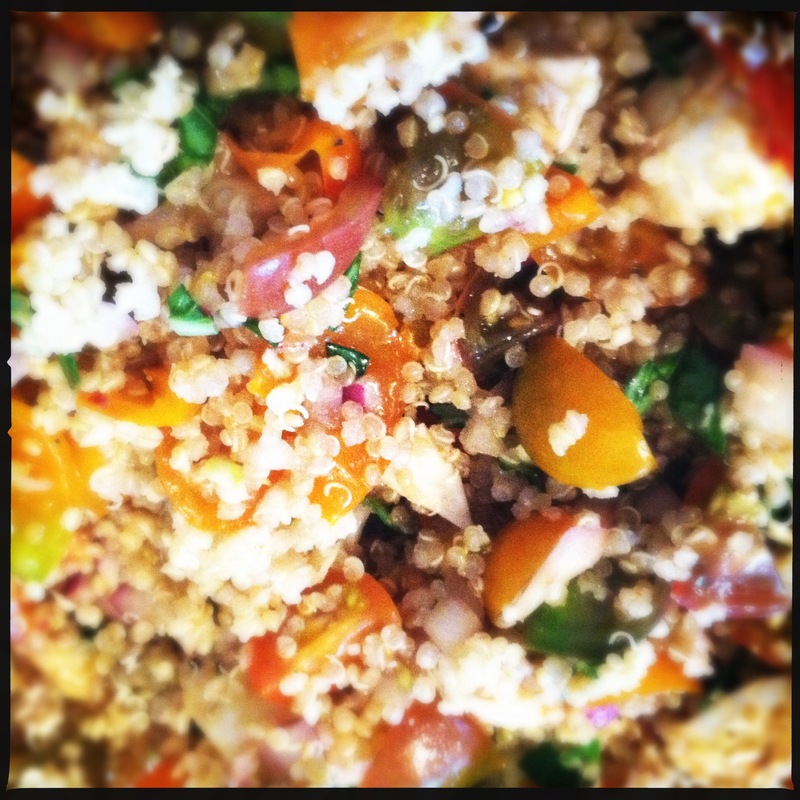 While quinoa is cooling, combine the tomatoes, onion, basil, and garlic. Add balsamic and olive oil (everyone’s taste is different but I think I ended up using about 1 tablespoon olive oil and 2 tablespoons of balsamic vinegar) as well as salt and pepper to taste. Add quinoa, taste, season more if necessary. Enjoy!! 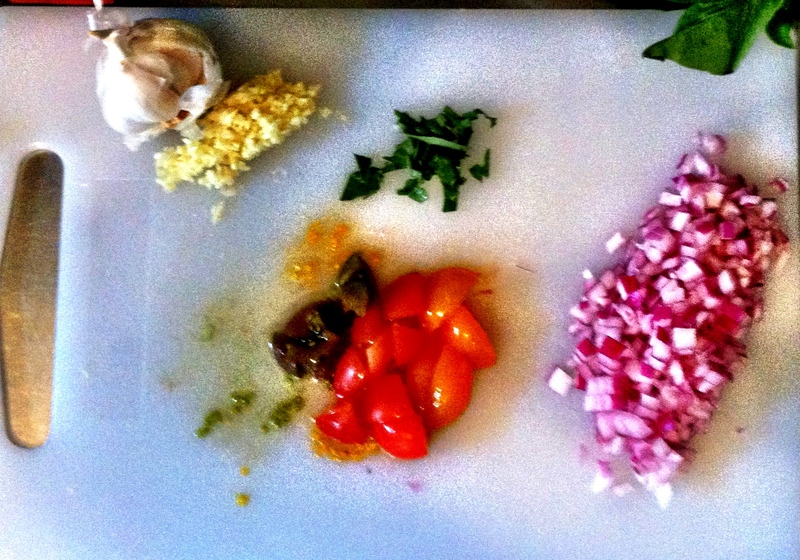 Note: I added the quinoa as a last step, but then realized that more seasoning was needed (especially more balsamic). In the future, I think I will add the quinoa before the salt/pepper/olive oil/balsamic, and even maybe try a balsamic reduction to increase the balsamic-y flavor, but for now, this version is more than acceptable (in my opinion!). I love Parks and Recreation. Everyone in that show is hilarious – and the episode where Tom Haverford (<3 Aziz!) and Donna take a day to treat themselves ranks up there in my top 5. I know I am not alone in this, and I’m also probably not the only person who has taken to treating themselves a little more after watching that episode. What can ya do?! 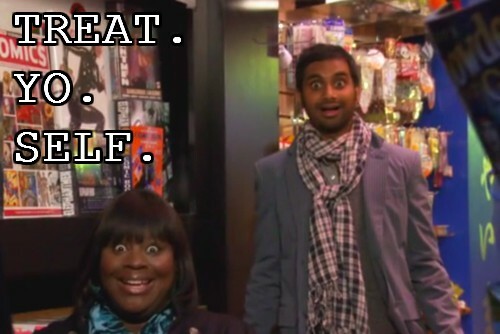 So, this is a food blog and I am going on and on about Parks and Rec and Aziz Ansari, and could probably continue to go on, but it is time to explain where food comes into this whole “Treat Yo Self” thing. See, I knew it was going to be a rough week, so I planned ahead. THANK GOODNESS for that, because rough doesn’t even come close to doing this horrific week justice. So planning ahead, in my Treat Yo Self world, means getting a Martha’s Salad Plate at Marti’s at Midday. O M G. I don’t even know where to begin. I had lived here almost a year before I first went to Marti’s (that was WAY too long to wait – if anyone reading this lives in Athens or within a 3 hour radius – GO RIGHT NOW, well, it isn’t open now, but go asap!). 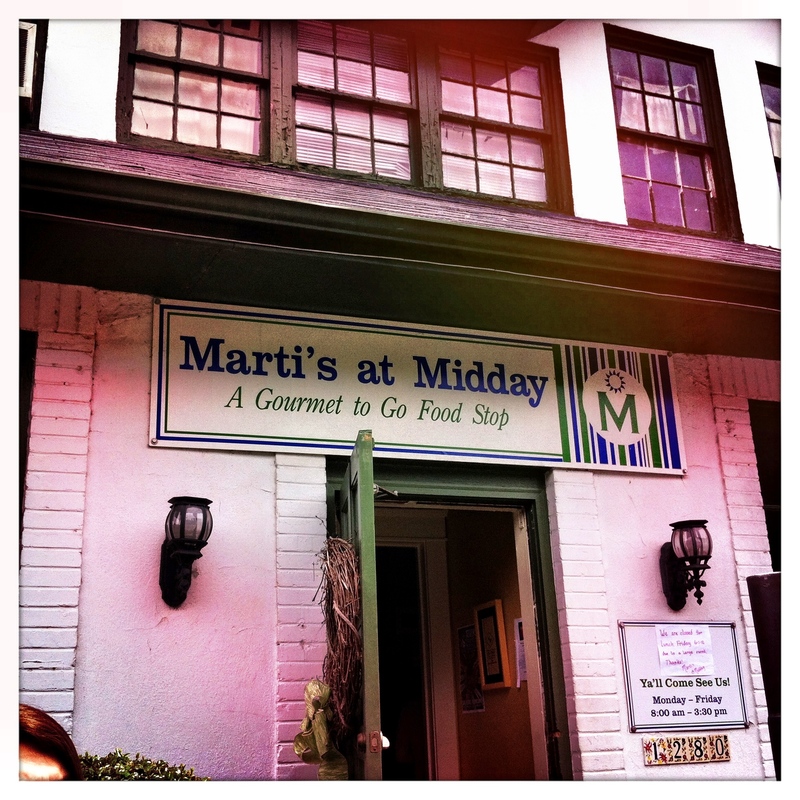 Marti’s is this cute, super southern little to – go food shop in a renovated house off of Prince Ave in Athens. They have fun commercials on TV down here with people raving about the food. I should have taken them more seriously because the food is FANTASTIC. Not only that, the portions are RIDICULOUS too. 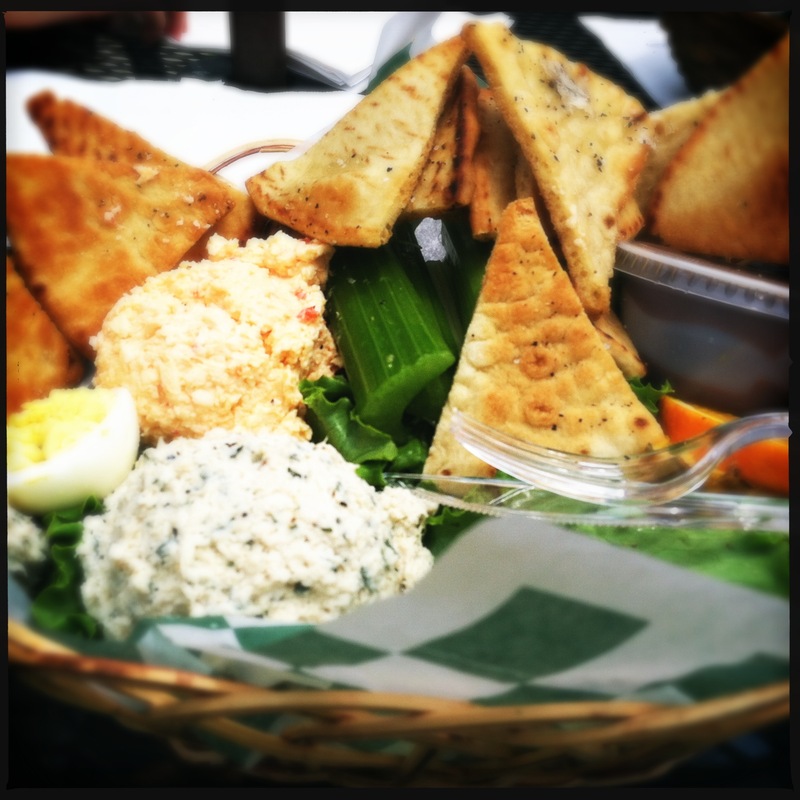 I’m thinking that my Martha’s Salad Plate (huge scoop of really yummy chicken salad, another huge scoop of pimento cheese, a deviled egg, salad with balsamic dressing, fruit, and homemade pita chips, oh those pita chips are the best part I think) weighed about 5 pounds. I’m not fantastic with estimating weight, but I really don’t think that is exaggerating too much. Needless to say, that lasts me like 4 meals for about $9. I honestly don’t know why I don’t just get one of those at the start of every week (oh yeah, all that pimento cheese probably isn’t good for me…definitely glad I didn’t discover that health food until I moved down here). OOO and the mint sweet tea, gotta mention that too. I am totally not alone in this Marti’s obsession, the whole reason that I chose Marti’s as my Treat Yo Self destination this week is because a girl that I met while shopping in Austin a few weekends ago went on and on about how much she missed Marti’s (she went to school at UGA prior to moving to Austin). Coming from someone who lives in Austin – with all the awesome food they have there – says a lot. Try and tell me that doesn’t look like a party on a plate. And finally, as I mentioned early, I whole-heartedly embrace the whole “Treat Yo Self” idea. I believe it was a once or twice a year thing in Parks and Rec, but screw it; sometimes it just needs to happen more often, especially in grad school (in my opinion of course). As such, I imagine this will be the first of many “Treat Yo Self” posts – so stay tuned!! athens baking breakfast cooking drinks food my reviews of my food snacks wecome!